News broke Sunday that Congresswoman E. B. Johnson, TX-30, in violation of anti-nepotism rules, had been awarding thousands of dollars in Congressional Black Caucus scholarship money to her own relatives and relatives of her aide. The recipients didn't even live in her district. Now stories are starting to appear from potential "very worthy" applicants in Dallas, Texas CD-30 who would have benefited from the scholarships. 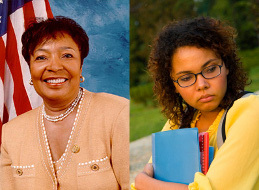 From 2005-2008 Eddie Bernice Johnson awarded 11 scholarships a year and "each of those years, three or four winners were related to her or her district director, Rod Givens." The congresswoman awarded this money to two of her grandchildren, two of her grand nephews and the children of her aide because, according to her, had there been more "very worthy applicants in my district" then "I probably wouldn’t have given it" to the relatives. As one of the thousands of college students living and studying in the 30th Congressional District of Texas, (to which I say you can no longer claim to "represent"), I am personally offended and appalled at your arrogant declaration of my lesser than deserving scholarship status. I want you to know me before you judge my qualification for scholarship. (1.) I am a multiply-handicapped, Social Security Disability recipient, living on a fixed income of $723 monthly. (2.) I am a registered voter, volunteer voter registrar, life-long "Yellow-dog Democrat", who both volunteered on your last two primary campaigns, and your last general election, along with GOTV efforts for said elections. (3.) For each of the last three school years, I resided in and attended college in the 30th Congressional District of Texas. (4.) I am an adult student living on my own, paying my own incidental fees and supplies for my studies, and solely responsible for repayment of the student loans required for me to attend college. (5.) I have consistently maintained a 3.75 GPA, despite vision and hearing impairments, a lifelong learning disability, and mobility impairment. (6.) Despite being chronically and multiply disabled, and certified as lifetime disabled under Social Security Disability guidelines, I have worked hard to educate myself, so that I could return to the tax-generating workforce; thereby exiting the Social Security, Medicare, and other public-assistance rolls. (7.) By my own calculations, the scholarship funds that you and your staff fraudulently disbursed to your co-conspirators, (were I deemed so worthy in your blinded eyes to have received) would have allowed me to use my limited personal funds to pay for my much needed dentures, that I have no way to pay for at this time. "Representative" Johnson, there is no excuse for your fraudulent and self-serving actions; and no amount of apology short of your immediate resignation that will suffice. You, your complicit staff, and your complicit offspring should be prosecuted under the same laws that you helped create... and nothing less. The saddest part of your crime is that given the communities and demographics that make up the 30th Congressional District of Texas, there are likely hundreds, if not thousands of students in situations like mine... and yet in your eyes we are summarily less than "deserving" of equal rights and equal opportunity. Eddie Bernice Johnson, have you no shame in your soul? No sense of humanity? Your pompous and self-serving actions have sunk you to the level of your former colleague William Jefferson of Louisiana. Whether the ill-gotten gains landed in your deep freeze or that of your relatives, it is still RICO acts that we are talking about. Twenty-five thousand dollars or ninety thousand dollars... felony is felony. Sixty-three years old (Jefferson) or Seventy-three (Johnson)... 13 years in federal prison sounds about right to me. Are there are more very worthy applicants in Dallas' Texas Congressional District 30 who would have benefited from the scholarships, had they been given an equal opportunity to access them?